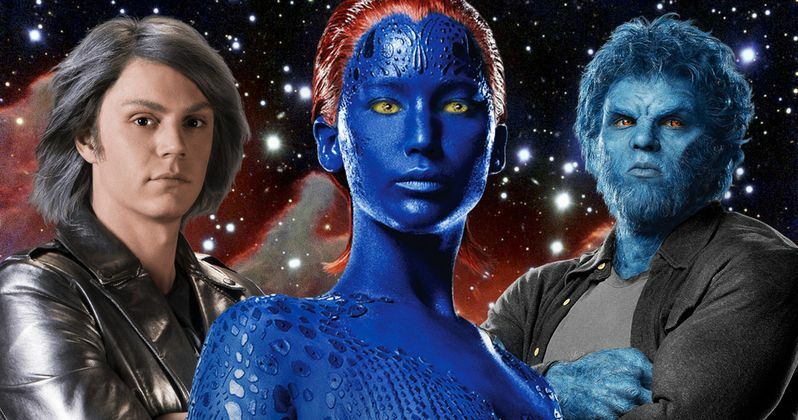 Later this month, 20th Century Fox will close out its X-Men prequel trilogy with the highly-anticipated X-Men: Apocalypse, which hits theaters on May 27. The studio is also developing a number of spinoffs such as The New Mutants and X-Force. And we recently reported that the next X-Men movie will be set in the 1990s. While doing press for X-Men: Apocalypse, director Bryan Singer shed some new light on what X-Men 7 will be, and where it will be set. The report from earlier this week didn't specify exactly which X-Men project will be set in the 1990s, whether it be the spinoffs X-Force or The New Mutant, or X-Men 7, which has been rumored to start production next year with the studio eyeing a 2018 release. Fandango had the chance to catch up with director Bryan Singer, who teased that this particular story may be set in outer space. Here's what the filmmaker had to say below. "That was something Simon [Kinberg] and I discussed a long time ago, all the way back to when I first pitched the studio on First Class -- that they do each movie in 10-year increments. It's a nice way for the audience to kind of keep track of the timeline, and it's fun to play in these different eras. So that's a good starting point. But we've also introduced the tenants of time travel, which already exists in the comic book. Also I imagine - and this is the first time I've actually answered the question this way - but another thing that's been introduced in the comics is a big alien, interstellar tenant within the X-Men universe that hasn't been explored. And to me, that might be kind of fun because I'm a huge Star Wars and Star Trek fan, and exploring the X-Men universe and being able to utilize that would be exciting, visually." There have also been rumors that this movie may reconfigure the Dark Phoenix story from the comics, which was told in the original trilogy. During 2014's X-Men: Days of Future Past, the timeline from the first three movies was essentially wiped out, which could make it possible for the Dark Phoenix story to be told again. While he didn't confirm that the Dark Phoenix story will be told in this new movie, he added that the new timeline created by X-Men: Apocalypse allows for limitless possibilities. "Like Apocalypse - like some of the imagery and characters and stakes [in that movie] - it's something we haven't seen before. If I'm going to be involved in a significant way, it has to be something different. Visually different and aesthetically different. So the '90s is a good jumping off point, but as we established in Days of Future Past and now with the formation of the X-Men - some characters in Apocalypse move towards their destinies. The characters who we knew from X-Men 1, 2 and 3. Meanwhile, some characters move in opposite directions. So it's somewhat limitless." As for the spinoffs The New Mutants and X-Force, it hasn't been announced when either of those movies will go into production, or if a release date has been set at this time. While there is very little we know about The New Mutants and X-Force, Bryan Singer teased that it would be possible for these movies to cross over into the flagship X-Men franchise. Here's what the director had to say below. "Yes, absolutely. But it has to be done right. Anytime you throw all these characters together to hit a start date, it can make a lot of money, but it can also be a clusterf*ck. To me, it has to be done with a lot of care. These things can get overwhelming, and if a character doesn't belong in a movie, don't use him. If the tone can still maintain itself, I'm all for it. What I'm not for is throwing a bunch of characters together and hoping it works." Production recently started on Wolverine 3, which will mark Hugh Jackman's last performance as the title character. We learned in the third trailer for X-Men: Apocalypse that Wolverine will show up in this movie, with Bryan Singer revealing earlier today in another interview that this version of Wolverine will be one fans have never seen before, shortly after he went through the Weapon X program. We'll be sure to keep you posted with more details on the X-Men franchise, so stay tuned.